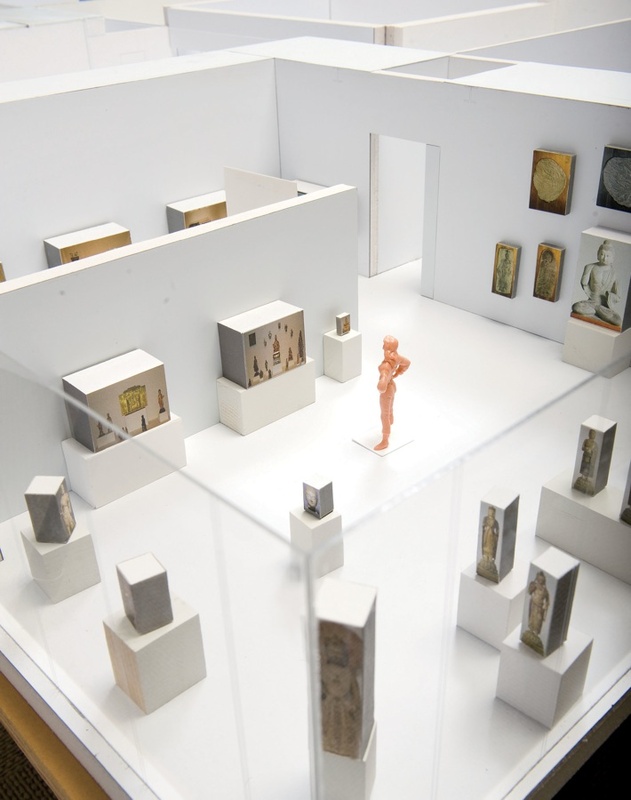 Using scale models of the galleries in the Harvard Art Museums’ new building, curators are already choosing the objects for permanent installation. 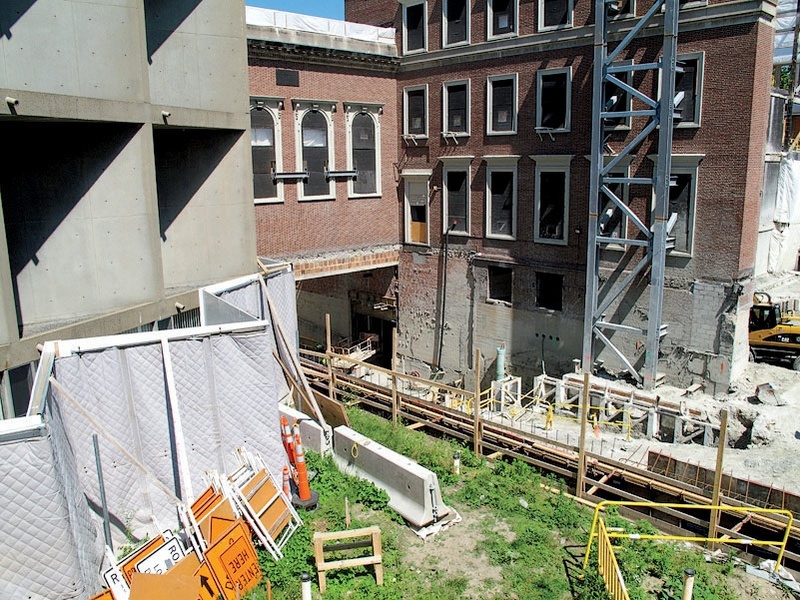 The original Calderwood Courtyard, a national landmark designed by Coolidge, Shepley, Bulfinch & Abbott, with its travertine marble arcades, will be restored to its place at the heart of the museum. 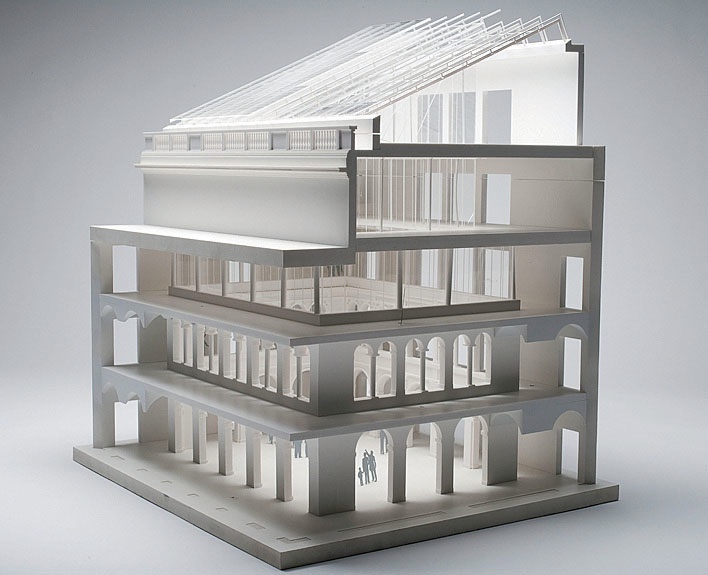 A rendering of the new building shows how the courtyard opens up to the glass lantern high above. 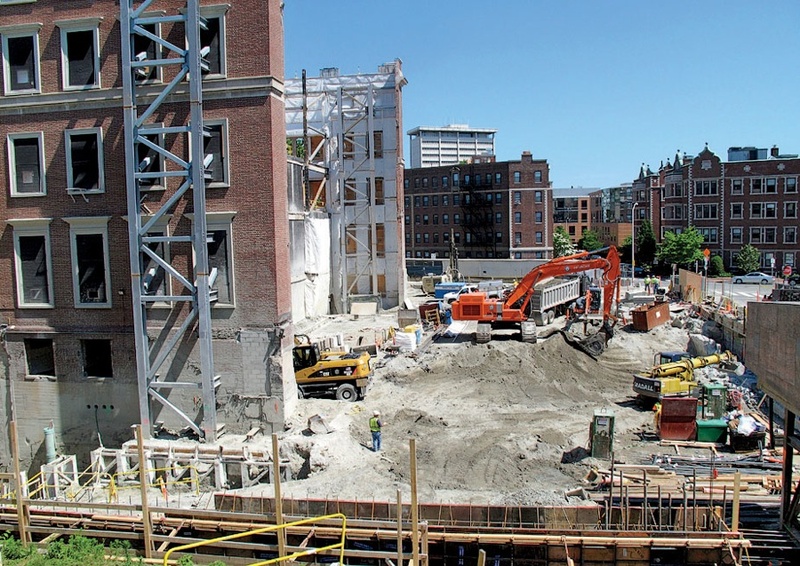 As of early July, construction of the new Harvard Art Museums building remained in the excavation phase. 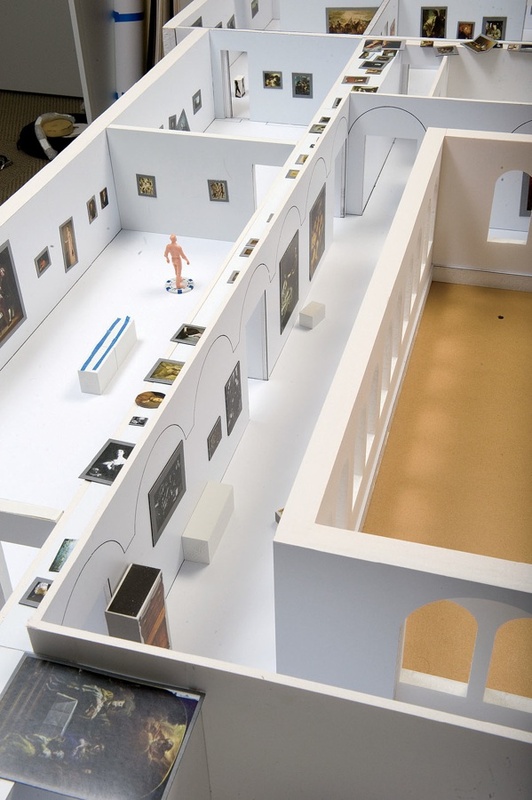 Like Gulliver among the Lilliputians, the hands of curators have been busy within this scale model of the renewed Harvard Art Museums. Working with tiny magnetized replicas of the more than 150,000 paintings, sculptures, urns, and other objects in the museums’ collections (now located off site at the museums’ storage facility in Somerville), curators must identify by September the artworks that will be on permanent display in the new space now being constructed at 32 Quincy Street, formerly known as the Fogg Museum, in which the University’s three distinct museums—the Busch-Reisinger, the Sackler, and the Fogg—will be united under one roof, while maintaining their separate identities. 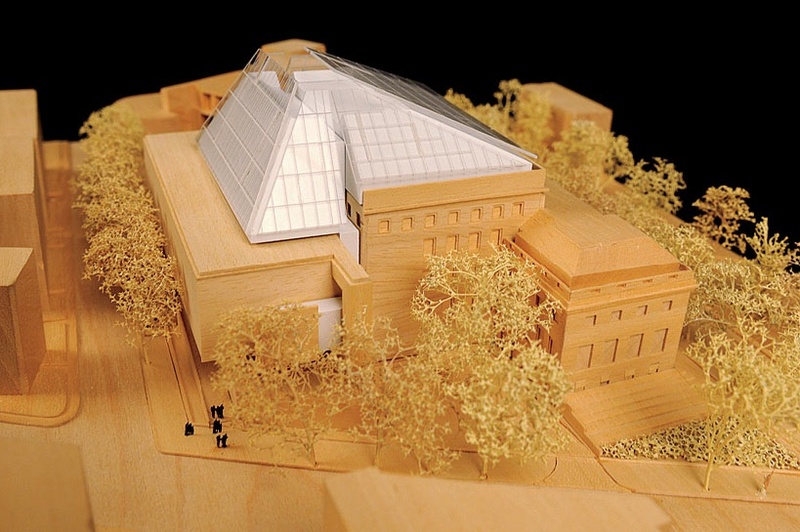 Although the building itself, which will reopen as the Harvard Art Museums, is not scheduled to be completed until 2013, the object lists that tell what goes in each gallery must be completed now so the art can be readied for exhibition, and conserved as necessary. Harvard is fortunate to have, in the Straus Center for Conservation and Technical Studies, one of the best such facilities in the world. The center’s staff is already at work on the Wertheim collection of Impressionist and postimpressionist paintings, drawings, and sculpture, which has been on permanent display for 40 years. Those works were removed from the public galleries on the fourth floor of the Sackler Museum in June as the first step in an elaborate set of moves designed in part to prepare faculty members for their expanded role in the new museum. After a special exhibition this fall—Prints and the Pursuit of Knowledge in Early Modern Europe—that fourth-floor Sackler space will be refilled with a combination of objects from the permanent collection, special exhibitions, and galleries specially set up for curricular use, the latter intended to ramp up faculty involvement with the installation of artworks connected to classes they teach. Previously the Sackler had only a few hundred square feet of such faculty-programmable space, enough for two to three rotating installations per semester. But by year’s end, there will be 1,000 square feet—and the new museum will devote three times that space to teaching galleries. The layout and features of the new building, previously estimated to cost $350 million, were completed after a two-year process of design, observation, and approval. 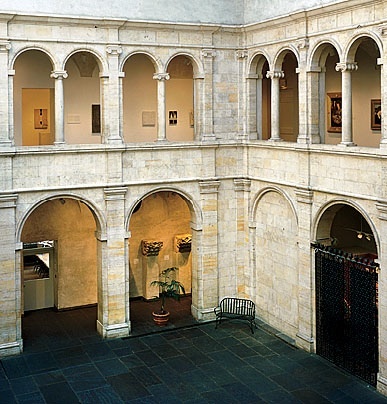 They are intended to enhance the museums’ role within the University’s pedagogical mission, as much as to address the deficiencies of the 1927 Fogg Museum building, where the problems included leaks, poor climate control, inadequate security, and a lack of storage space. (A renovation was originally called for in the so-called Brown Report of 1956.) The new design, by architect Renzo Piano, will make the building not only more open and transparent, but also more integrated. The museum shop, for example, which stood at the back of the former courtyard, blocking passage to the rest of the museum, has been moved off the courtyard to the left, while a new café will mirror it to the right. “People will recognize the old façade and the entrance and the courtyard,” says Lentz, “but essentially it is a brand new building.” The outer walls of the original structure are being buttressed, waterproofed, and enormously strengthened with structural steel. Except for two New Deal-era frescoes too massive to move, everything else that was within those walls has been relocated, leaving behind an enormous hole. Eventually, once the historic entrance and central courtyard have been restored on the first floor, it will be possible to gaze through them to a second entrance on Prescott Street, and to pass under the travertine arches surrounding the courtyard directly into the galleries. The redesign of that landmark courtyard involved numerous consultations with the Massachusetts Historical Commission. On the topmost level, there were no arches, as on the first two levels, just an encircling blank wall punctuated by windows with shutters and topped with the suggestion of a red tile roof. Above that, the original ceiling was a laylight (a glazed panel flush with the surrounding ceiling). 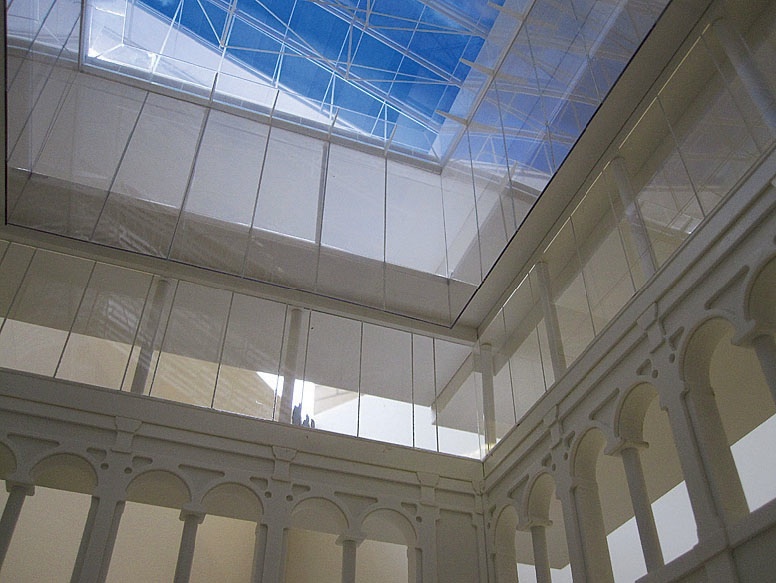 Renzo Piano felt the third level, a last-minute addition to the 1927 design, suffered from problems of proportion, and so eventually secured permission to redesign it. Deciding where to put the new ceiling, and what materials to use, took longer; eventually, Lentz and Piano’s workshop decided on no ceiling at all—opting instead for a direct line of sight from the first floor up to the glass lantern above the fifth floor, which will flood the space with natural light. The fourth floor will house three study centers, two seminar rooms, and an analytical lab (part of the Straus Center). This level will be primarily for the use of students and researchers, but it will also be open to the public, so there will be a reception desk at the top of the stairs. The Straus Center will occupy the fifth, uppermost floor with labs for the conservation and study of objects, paper, and paintings. The much-expanded lower level of the building—now a deep pit filled with construction machinery­—will include a 300-seat auditorium, a 100-seat classroom, and a smaller, 30-seat classroom, allowing the museum to host a mix of public lectures, events, and art projects for schoolchildren. (Visitors will be able to enter the public areas of the lower level at night, when the rest of the museum is closed.) And there will be 8,000 square feet of storage space for the artworks kept on hand for close examination in the study centers upstairs.